Frank Chopp, a Democrat from Seattle, also sketched out priorities for the upcoming legislative session, including a possible capital-gains tax. 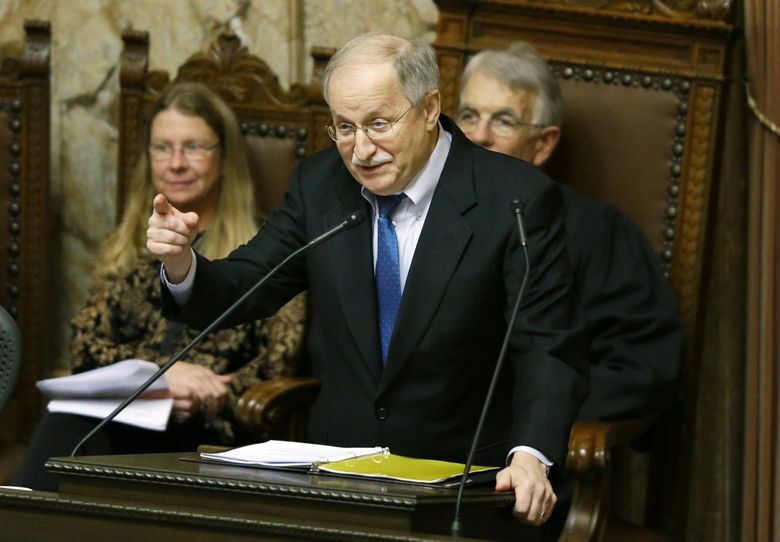 OLYMPIA — Washington’s Democratic House Speaker Frank Chopp on Wednesday vowed to run for re-election in 2020, and sketched out priorities for the upcoming legislative session — including a possible capital-gains tax. The state’s longest-serving speaker, Chopp on Tuesday announced he would give up his gavel “to provide an orderly leadership transition” for Democrats after the legislative session that begins in January. But he said he intends to run again for his House seat in Seattle’s 43rd Legislative District. “I’ve got a lot of energy, in case you haven’t noticed,” the media-shy Chopp said at a news conference. He also sketched out his priorities for the legislative session, which include focusing on Washington’s troubled mental-health system, improving student financial aid and working on an array of housing issues. He said lawmakers must come up with new revenue to fund existing services and needed new programs in Washington’s 2019-21 state operating budget. New revenue could include a capital-gains tax, which House Democrats and Gov. Jay Inslee have proposed in recent years. He also acknowledged the possibility of using a capital-gains tax to lower state property taxes, which House Democrats proposed in 2018. Lawmakers and Inslee in 2017 approved an education-funding plan that raised state property taxes but in turn will cut local property taxes in many districts. Some Democrats decried the bipartisan compromise, which boosted overall taxes in school districts around the Puget Sound. Senate Minority Leader Mark Schoesler, R-Ritzville, panned the idea of a capital-gains tax. Republicans say it’s a tax on income and thus unconstitutional in the state. Washington has seen higher-than-expected revenue projections for existing taxes. Revenue projections for the 2019-21 state operating budget are estimated to be $50 billion, several billion dollars above the current budget. Lawmakers and the governor will draft the new budget — which funds schools, parks, prisons and social-service programs, among other things — during the legislative session. But state budget officials and the governor’s office have said $50 billion will not be enough to fund the natural growth of existing government programs, pay for needed improvements in the mental-health system, fund collective-bargaining agreements for state workers and make other necessary changes and additions. Inslee spokeswoman Tara Lee wouldn’t say whether the governor’s budget plan — scheduled for release in December — would include a capital-gains tax proposal. On Wednesday, Chopp said that he has long debated whether to step down from the speaker position, but has considered it more seriously in recent years. He said 2019 is a good time to step down as speaker, noting that Democrats picked up seven House seats in the November elections, bringing the party’s margin of control in the chamber to 57-41. “I think it’s good to make the transition when you’re at a strong point and a high point,” he said. Democrats will choose a new leader next spring, after the legislative session concludes, said Chopp. He said he doesn’t plan to make an endorsement in that race. Chopp brushed off questions that his presence as a former speaker serving as a rank-and-file lawmaker would be difficult for the next speaker, or that he might be considered a lame duck now that he’s announced his eventual departure.